Personally, I find it insulting when golf cart manufacturers assume that all golfers have the same size bags. I for one use different bags depending on what course I am going to play on but very few golf cart manufactures have seemed to catch on to the fact that real golfers need a versatile cart that can handle different sized bags. Bag Boy has been one of the rare exceptions. I use their Quad XL Golf Cart for every round that I play because it can accommodate whatever bag I am using. Tipping has always been an issue with other carts which is why, when it came time for me to buy a new one, I went with a 4-wheel design. Again, it doesn’t matter what kind of bag I am using in my 4-wheel Bag Boy Quad XL Golf Cart because it holds up even with sloppily loaded and cumbersome bags. So that is why I personally like this cart but there is more to it than that. This is a cart that definitely deserves an in-depth look. The Bag Boy Quad XL Golf Cart comes with some features that aren’t necessary but are definitely handy on the golf course. As a golfer you can probably relate to playing through inclement weather which is why it is nice that this cart comes with an adjustable umbrella holder. You can actually move the umbrella holder attachment to either the left or right side of the cart – a feature that I have already used many times when playing through shifting sunlight. If you are familiar with some of Bag Boy’s older push caddy models then you will probably appreciate the fact that the Quad XL has a storage space that can fit a large score card, your phone, tees and balls. There is also a drink holder of moderate size to accommodate thirsty golfers. Have you ever had your cart run away on you when you weren’t paying attention? That won’t be the case with the Quad XL so long as you remember to engage the solid parking brake that inserts a pin into one of 12 notches that surround the rear right wheel. Golf bags vary greatly in size and shape and so do golfers themselves so it is nice that the Quad XL push handle is almost infinitely customizable. You can essentially make it as low or high or angles as you want. The first time I took my Quad XL out on the course I was very impressed with how easy it was to maneuver. The front wheels which sport a 9.5 inch diameter are set slightly narrower than the 11.5 inch rear wheels and that offset makes it infinitely easier to turn. 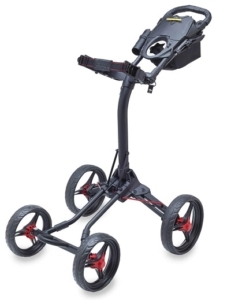 The cart without any gear loaded onto it weighs in at 16.5 pounds which is a good mid-rage weight for a cart to be both easy to handle and durable. You don’t have to worry about flats either. The wheels on the Quad XL are solid and do not require inflation. Overall the Quad XL has performed well in action. Even with my bags and all my knick-knacks loaded onto it, the cart still pushes smoothly through any type of turf. The phone mount sits right between the handles so you can look at your phone hands free while pushing the cart. The jury of one (me) deems the Bag Boy Quad XL Golf Cart a worthwhile product. If you are anything like me then you will benefit mightily from the adjustable front wheels that help the cart to accommodate different sized bags. The ball storage space and the high center of gravity coupled with the somewhat narrow wheel base do leave something to be desired but it is that same narrow wheel base that makes the Quad XL so easy to manage and for my money, maneuverability trumps a high center of gravity. I consider myself a versatile golfer and I recommend the Bag Boy Quad XL to any golfer of the same ilk. If you are in the market for a 4-wheel push caddy then you should definitely give the Bag Boy Quad XL a good once-over.